The stunning 30th Anniversary Series-II Bass! Hi, I'm selling my wonderful 5 strings PEDULLA RAPTURE PJ-5 of 1994, for a STATUS 5 strings bass. This Pedulla was made in U.S.A. Very light Plain soft maple body, Maple neck and Birdseye maple fretboard, with abalone dots. Tortoise pickguard. Cherry Red sunburst finish. Matched headstock. 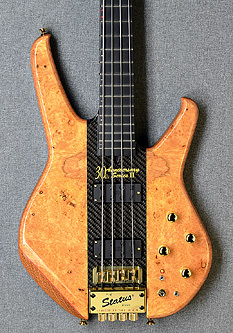 Original 2-band active preamp with Bartolini RB-PJ pickups. 19mm strings space. 34" scale. 22 frets. Including Schaller strap locks and Maruszczyk soft case. Interested in a Status 5 strings (mostly KING BASS model, 16,5mm strings space or similar, 32" scale), w/trussrod. In any case I evaluate other 5 strings Status basses proposals! MMI Modica. Docente abilitato Modern Music Institute. Paradox theme originally by Digitanium. Converted to PHP-Fusion v7 by Kenneth.